When ordering or registering, we may ask you for your name, e-mail address, mailing address, phone number, credit card information or other information. We need this information to verify your billing status and then bill you for your purchases. We will then use your street address to ship you the products you purchase. We may retain this information for other uses as more fully set forth below. We will never give out any details related to your credit card to anyone. Credit card information is encrypted and stored in a secure server. Only authorized personnel in our billing department have access to this information. This access is limited to processing payments and/or refunds to your credit card. If you subscribe to our Neat Cloud Service service, we collect and store all of the materials you post on your Neat Cloud Service account in connection with your use, including without limitation all images and metadata concerning the materials you post (“Customer Content”). We record additional log data in connection with your use of the Sites, including information from your Device, its software and your activity using the Sites. This may include the browser type on your Device, the web page visited before you came to the Site, information you search for on the Site, locale preferences, identification numbers associated with your Device, your mobile carrier, date and time stamps associated with transactions, system configuration information, and other interactions with the Site. Like many websites, we use “cookies” and other persistent identifiers to enhance your experience and gather information about visitors and visits to our Site. Please refer to the “Do we use ‘cookies’?” section below for information about cookies and how we use them. To bill you and ship you any products or activate any services purchased on this Site. To offer you products, services, software updates and promotions that we believe may be of interest to you. To administer your use of the Site. To improve our products or services and to create new products or services. We also collect some information (ourselves or using third party services) using logging and cookies, such as IP addresses, which can sometimes be correlated with personal information. We use this information for the above purposes and to monitor and analyze use of the Site, for the Site’s technical administration, to increase our Site’s functionality and user-friendliness, and to verify users have the authorization needed for the Site to process their requests. We do not use Customer Content for any of these purposes other than as necessary to administer and develop the Site or our storage of that Customer Content. We may release your information and materials you post on your account, including Customer Content, when we believe release is appropriate to comply with the law, respond to subpoenas, legal document requests or court orders, enforce our Site policies, protect ours or others’ rights, property, or safety, or prevent fraud or abuse of the Site or its users. If we provide your information or materials to a law enforcement agency as set forth above, we will remove Neat’s encryption from the materials before providing them to law enforcement. However, we will not be able to decrypt any materials that you encrypted prior to storing them on the Site. In addition, we may disclose your non-private, aggregated, or otherwise non-personal information, such as usage statistics of the Sites. You can correct or update your personally identifiable information by changing your account settings or by contacting us by electronic-mail at customerservice@neat.com. In some cases we may retain copies of your information if required by law. 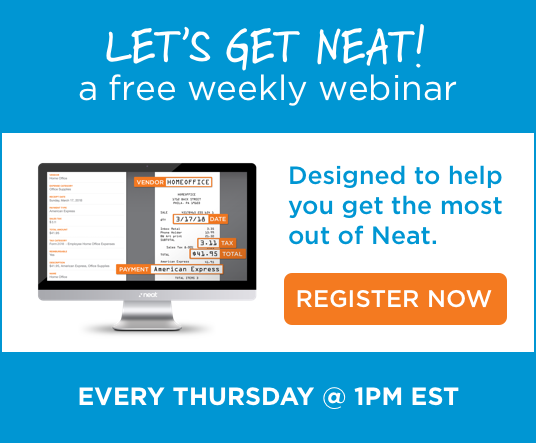 For questions about your Personal Information on our Service, please contact privacy@neat.com. We will respond to your inquiry within 30 days. Depending on your Device and software, you may be able to choose to have your computer warn you each time a cookie is being sent, or you may be able to choose to turn off all cookies. You do this through your browser (like Mozilla Firefox or Internet Explorer) settings. Each browser is a little different, so look at your browser help menu to learn the correct way to modify your cookies. If you turn cookies off, you won’t have access to many features that make your Site experience more efficient and some of our services will not function properly. We primarily use your personal information such as geographic locality and date/time purchased to analyze the buying habits of our customers and recognize marketing trends. We will retain your information for as long as your account is active or as needed to provide you services. We may retain and use your information as necessary to comply with our legal obligations, resolve disputes, and enforce our agreements. Consistent with these requirements, we will try to delete your information quickly upon request. Please note, however, that there might be latency in deleting information from our servers and backed-up versions might exist after deletion. In addition, we do not delete from our servers files or materials that you have in common with other users. Our services offer publicly accessible community services such as blogs, forums, and wikis. You should be aware that any information you provide in these areas may be read, collected, and used by others who access them. Your posts may remain even after you cancel your account. Neat follows generally accepted standards to safeguard and help prevent unauthorized access to your data, maintain data security and correctly use personal information. This includes Secure Socket Layer encryption of all data in transmission and a 256-bit encryption of scanned or other images in storage (or “at rest”). The 256-bit Advanced Encryption Standard (AES-256) is one of the strongest block ciphers available and is the same encryption standard banks use to secure customer data. However, no commercial method of information transfer over the Internet or electronic data storage is known to be 100% secure. As a result, we cannot guarantee the absolute security of that information during its transmission or its storage in our systems. Accordingly, the standard metadata fields available in Neat products do not include sensitive personal information such as social security number or bank account information. Neat recommends that users should not create such metadata fields or store in metadata any information the disclosure of which would cause harm to you. If you have any questions about security on our website, you can view our Security Policy or contact us at security@neat.com. Our Products and Services are not directed to persons under 13. We do not knowingly collect personally identifiable information from children under 13. If a parent or guardian becomes aware that his or her child has provided us with personal information without their consent, he or she should contact us at privacy@neat.com. If we become aware that a child under 13 has provided us with personal information, we will take steps to delete such information from our files. Under California’s “Shine the Light” law, California residents who provide personal information in obtaining products or services for personal, family or household use are entitled to request and obtain from us once a calendar year information about the customer information we shared, if any, with other businesses for their own direct marketing uses. If applicable, this information would include the categories of customer information and the names and addresses of those businesses with which we shared customer information for the immediately prior calendar year (e.g., requests made in 2012 will receive information regarding 2011 sharing activities). To obtain this information from Neat Company please send an email message to privacy@neat.com with “Request for California Privacy Information” on the subject line and in the body of your message. We will provide the requested information to you at your e-mail address in response. Not all information sharing is covered by the “Shine the Light” requirements and only information on covered sharing will be included in our response.